This is a time lapse video of a radish seed growing into a harvestable plant with a fairly well developed taproot. The plants were intentionally deprived of sufficient nutrients until about 38 seconds in, where liquid nutrients were added to the top. 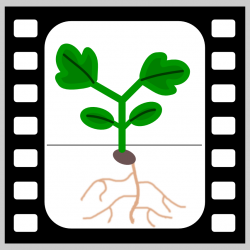 The taproot growth part of the video was accelerated relative to the primary shoot growth part. The total time lapse length was 49 days.